HAVE KIDS, WILL TRAVEL special event: I've been featuring a selection of special travel-related items for review that should make your next family vacation even more enjoyable! Today's giveaway is of a fun, kid-friendly suitcase that I've had my eye on for awhile. Melissa & Doug are promoting fun and happy family travel for this upcoming holiday weekend. To celebrate they're offering my readers a chance to win one of TWO Trunki kids suitcases in the winner's choice of color, along with a saddlebag, tote bag, and 3 packs of decorative stickers — a $76 value! But the kicker is that kids can ride on them. You can pull the suitcase along the normal way (as a suitcase on wheels), or you can have your kidlet sit on it and pull both along behind you. No more dragging a tired toddler through an airport — or chasing a wired one! As someone whose families live across the country, I think this suitcase is a brilliant invention for family travel with the toddler through preschool crowd. 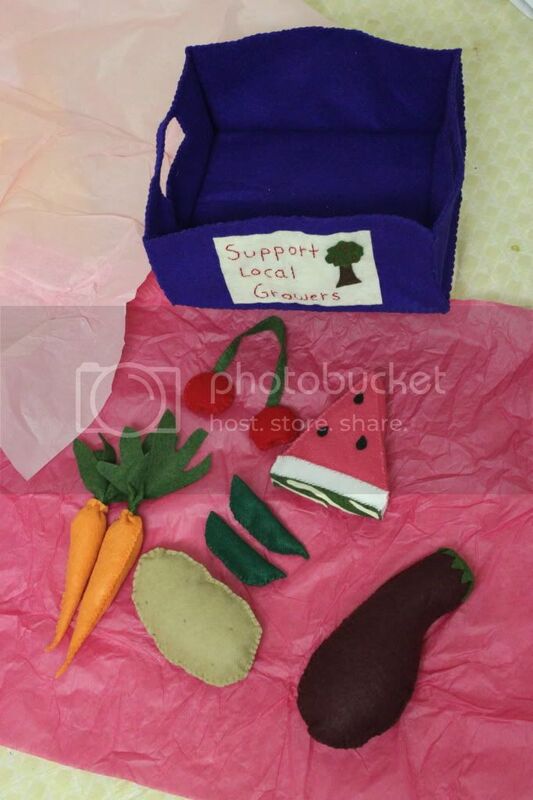 Mama's Felt Cafe is offering NPN readers a giveaway of a $25 gift certificate to her felt food store for adorable hand-crafted play food! I was so excited when I was given the opportunity to review a product from Mama's Felt Cafe. 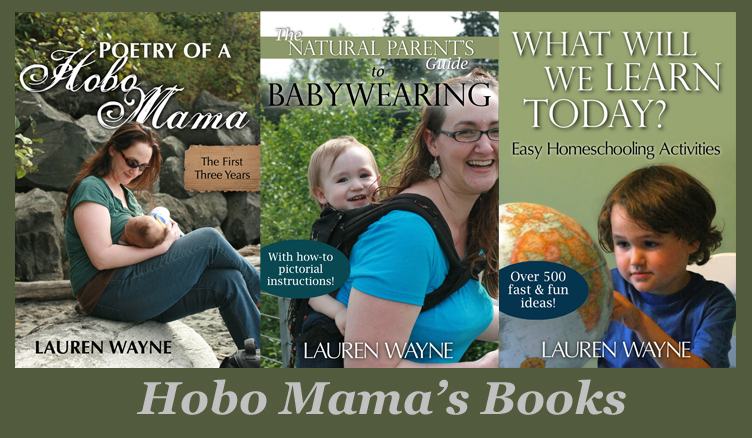 Seeing her ideas was like an 'Ah-ha' moment, and I realized I could take responsibility for the toys my children play with by making them myself. Of course since I do not have infinite time on my hands, getting a few felt originals to start my collection was like a dream come true. Brittany, owner of Mama's Felt Cafe, sent me a "Support Local Growers" basket for my daughters to man-handle. … As I took out each piece and inspected it, I noticed how fine the stitching is and how every little detail of the real food is present in the replica. For instance, the potato actually has tiny "eyes" all over both sides and the watermelon rind is two-toned and striped to mimic the real fruit. … This set is so versatile because every piece can be used in an infinite number of scenarios, and even the basket itself has tremendous possibilities. It is sure to inspire the cook or vegetable eater in every child. I was excited when BlogHer offered me the chance for a Walgreens post, because we already shop at Walgreens for health and wellness products, and I'm a huge fan of buying store brand. I've found that most store brand products have the same active ingredients as other national brands, and Walgreens brand products are no exception. Considering how much over-the-counter medications, first aid products, and other health-related items can set a family back in these days of rising healthcare costs, it's worth saving on these essentials if you can be assured of their quality. I found out Walgreens Brand Health & Wellness Products are Walgreens pharmacist-recommended and have a 100% satisfaction guarantee. So there's nothing to lose by trying them out in place of any highly advertised brand that's virtually identical. Why pay more for the same quality? I also appreciate that Walgreens is giving back to the community with the Way to Well Fund: A cent from the purchase of every Walgreens Brand Health & Wellness Product, up to $3 million annually, will support bringing preventive wellness services to local communities. Keep reading to hear about my adventures in reviewing Walgreens Brand items and to learn how YOU can win a $100 Walgreens gift card of your own from BlogHer. The assignment for the review was to buy three seasonal products from the Walgreens Brand Health & Wellness selections. No problem — except for the narrowing down! There was plenty I could use for the summer. And I didn't have too much time to shop, given that I was due to give birth to my second child at any minute. As it turned out, I bought my items just in time, and now I'm writing this review on the other side of the birth! My friend Amy had come up to help me prepare for the birth, so we headed out to one of my many local Walgreens stores with our boys along to help us shop. My four-year-old, Mikko, is a whiz at displaying products, as you can see. Forgive the cell phone pictures — I had to seize the chance I had to shop and didn't have a nicer camera along. I figured it was good that I got it all taken care of, considering I went into labor two days later! I hadn't even waited for my sponsor-provided gift card to arrive before buying my products — good thing, huh? A note on the prices: I was given a $50 gift card to buy three products, and my three choices came to only about $11. I think it's fabulous when it's hard to spend $50 at a store. 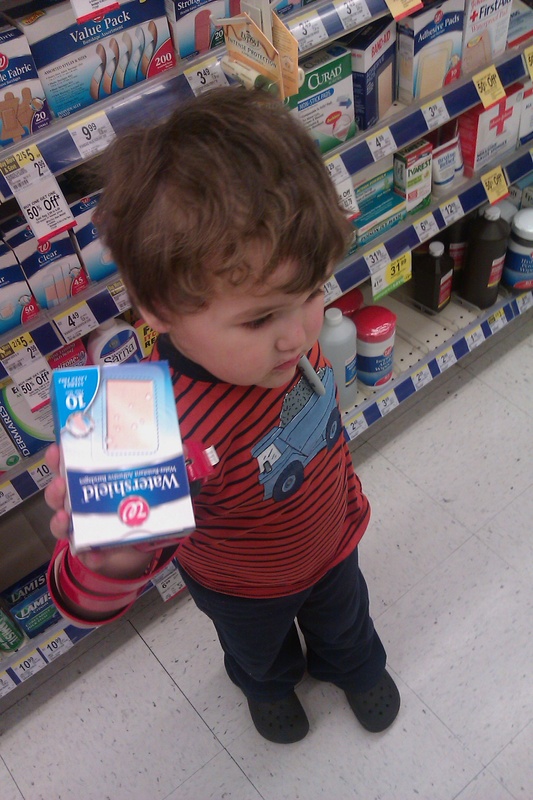 We headed first into Mikko's favoritest section of any drugstore: the bandage aisle! He can't get enough of first aid products. For himself, he prefers rolled gauze and tape. For others, e.g. 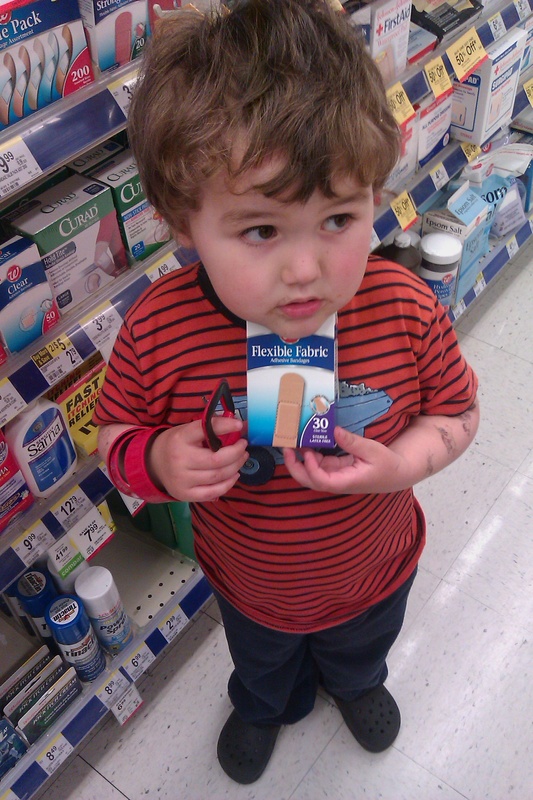 his father and me, he loves adhesive bandages — and lots of 'em. It doesn't really matter whether you have an owie or not, truth be told. 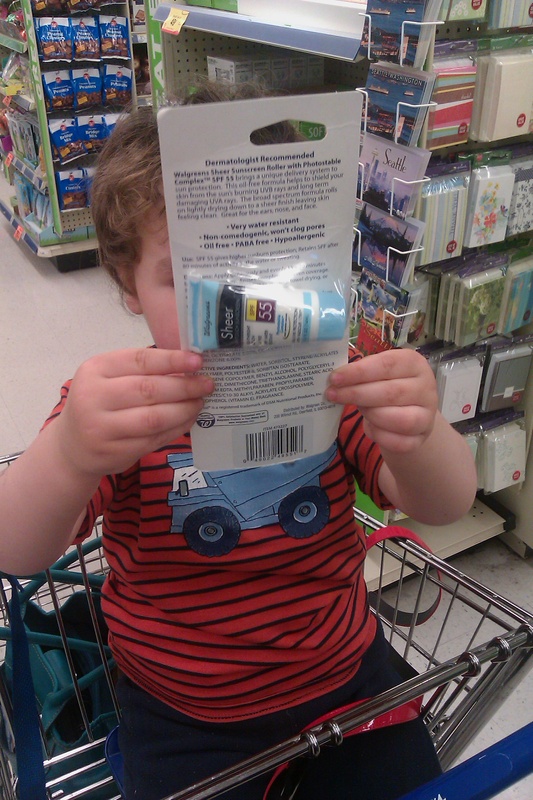 He picked out flexible fabric ones first, then these large Watershield bandages. I thought those looked the most intriguing so slyly swapped them out for a variety pack. I like having clear bandages — looks less goofy and noticeable. 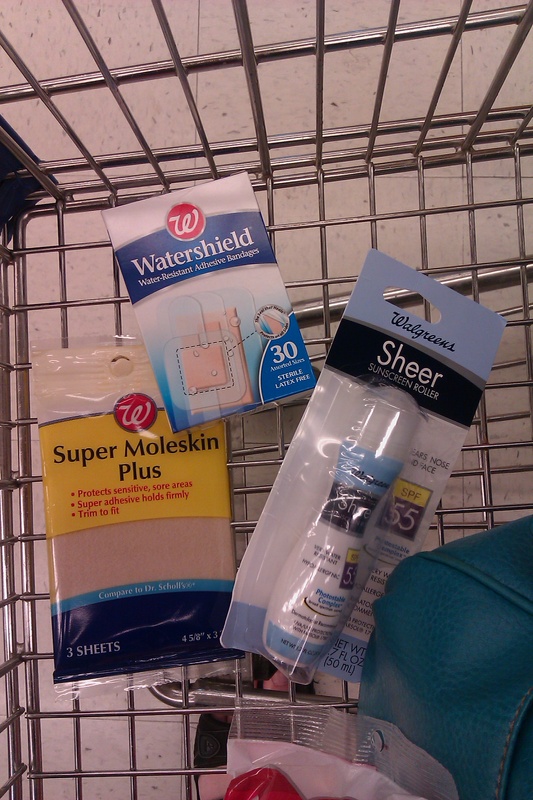 And the idea that they might be more water-resistant than regular bandages appealed to me. Fortuitously (I guess), I had two hangnails — one on each index finger — that were giving me some pain. I figure it was due to all the extreme nesting I was doing at nine months pregnant, including having installed a toilet that day. (Because you know that makes sense to do when you're super-pregnant.) Usually I would put a dab of a liquid bandage on a hangnail, but I was trying to avoid extra chemicals due to the little one within, so I got to try out a bandage on each finger instead. The good news is, they were entirely like other bandages I've tried, both store brand and brand name. The bad news is, the Watershield promise was overstated — they didn't stay on any better than any other bandage (or any worse). I found it rather humorous that the box even suggested changing the bandage if it got wet. Oh, well! I'm still glad to have them around, both because I like the clear bandages and considering how quickly we go through them with a four-year-old nurse-in-training to dole them out. The price was right. And I would definitely buy Walgreens brand bandages again. I think next time I'd just look to see if there was a regular version that cost less than the Watershield and go with that if so. I headed to the foot care section next. Being at the end of pregnancy, I very much appreciated the warmer weather that had come through for seemingly the sole purpose of allowing me to wear my comfiest sandals outdoors. I had tried to wear some lighter shoes (read: prettier) the day before, and they chafed on my winter-tenderized feet (wusses), leaving a couple blisters. 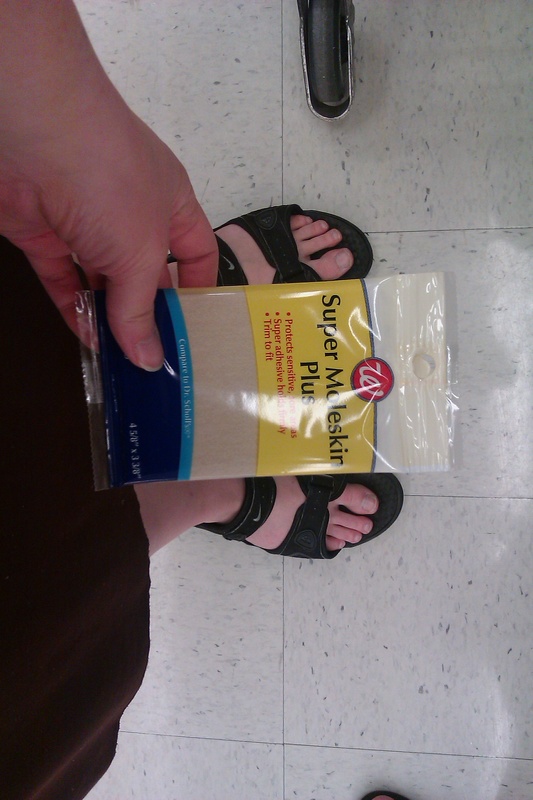 This recalled to me the necessity of stocking up on padding to make it through the early days of summer, in which I train my feet to build up some calluses and quit complaining about going sockless! Walgreens to the rescue! I love moleskin padding for anyplace a shoe pinches: the toes, the straps, the heels. The adhesive means you can stick it in place and have all-day comfort. The neutral coloring doesn't match every (any?) skintone, but it has that don't-pay-me-any-notice vibe. And the rectangular sheets mean you can cut out any size or shape of padding you need. Artsy shot for no good reason! I love using moleskin (NB to the queasy: not made of actual moles or actual skin) in new shoes, for sandal weather, and for jogging. I have a bad habit of always buying running shoes too small, so I need the padding to make it through. Now, I am not currently carrying out my running routine — nor have I been for some months — but I do plan to ease back into it this summer, so having the moleskin on hand is essential. And I absolutely plan to wear sandals all.summer.long, so I need to make sure my wimpy feet can handle the pressure. Since I'm not allowed, by midwife order, even to walk down the stairs at the moment, I can't exactly test the moleskin to its limits, but I did give it a nice feel and a tug on the adhesive. The padding is very soft, and the adhesive feels quite strong. It feels, in fact, exactly like a name-brand version I've used before. I think it will do exceptionally! I am pale. Really, really pale. Scandinavian and Celtic pale. Like, when Sam and I visited Cornwall in England in the late spring, I was the one who ended up at the chemist's trying to explain to them how on earth I could possibly have a sunburn and heat rash. And that was among generally pale people. So I rely on sunscreen, among other protective measures, to keep myself from turning into a lobster in the summertime, even up here in the mild coastal northwest. So this roll-on facial sunscreen spoke to me. It said, "Laaauuuren! I will be so much easier to smear on your face than a goopy tube of sunscreen. I won't clog your pores and make you look all greasy or chalky. I will be easy to rub in. You will want to put me on before a day in the sun — and even throughout the day!" The thing with sunscreen is that I'm conflicted between going all-natural (zinc oxide, titanium dioxide) versus using the formulations that make me apt to apply sunscreen in the first place, and then reapply it as needed to keep my protection up. I am not the kind of person who develops a protective tan — never, ever, ever happens, despite my most fervent attempts from elementary through high school — so I really do need to rely on commonsense, clothing and hat cover-ups during the summer, and also a nice thick layer of sunblock or sunscreen, particularly if I'm going to be out all day or during the hottest part. My compromise so far is, for everyday coverage, to use mineral makeup that contains natural sunblockers, and to try out some natural body sunscreens for my hands, arms, chest, neck, and ears. But if I'm going to be out swimming or on the beach, I like to use a spray sunscreen that covers all of me more easily. However, my face is still a sticking point. Quite literally, I don't like having it be all sticky. So finding an easy way to apply a liberal amount of sunscreen across my features? Golden. 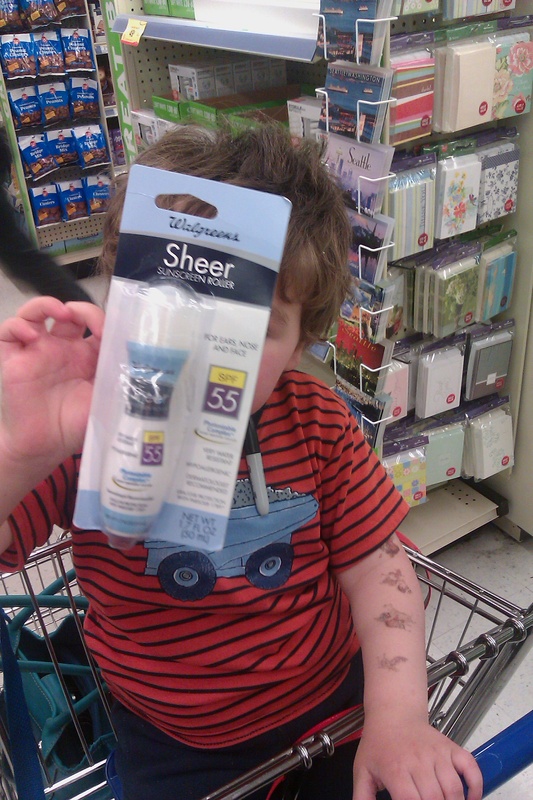 Looks like he's showing you the bonus travel sunscreen it came with. Actually, he just forgot that to pose with something so the camera can see it, you have to not be looking directly at it. I haven't hung out at the beach since buying this to have thoroughly tested its sunblocking powers, but the active ingredients are the same as in my go-to body sunscreen. I was hoping the roll-on application would be easy and comfortable — and it was! It smoothed across my face in a nice, fairly even coating. I still had to rub it in — it didn't go on so evenly that it just instantly absorbed or anything — but I found the rubbing in to be low-stress since the coat had been spread so thin for me by the roller. The SPF 55 might be overkill for any normally toned people, but I'll take the highest protection factor I can get. I like the idea that nothing's getting through that barrier. While I was outside that day, I didn't notice any excess shininess, and I didn't get any stinging to suggest I was sweating it down and irritating my eyes. I think this will be the perfect roll-on to tuck into a beach bag or purse for a day out in the sun. It's the type of sunscreen you can reapply without a mirror without fear of ending up with goofy white lines where you didn't blend it enough. If you have sunscreen-averse family members and kidlets, something like this that's fun and easy to apply might just be what's needed to convert them. 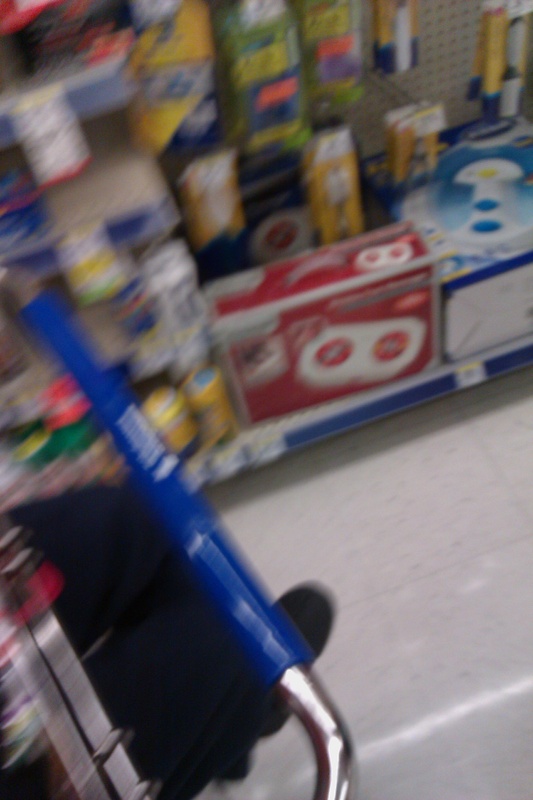 You never know what else fun you'll find at Walgreens. 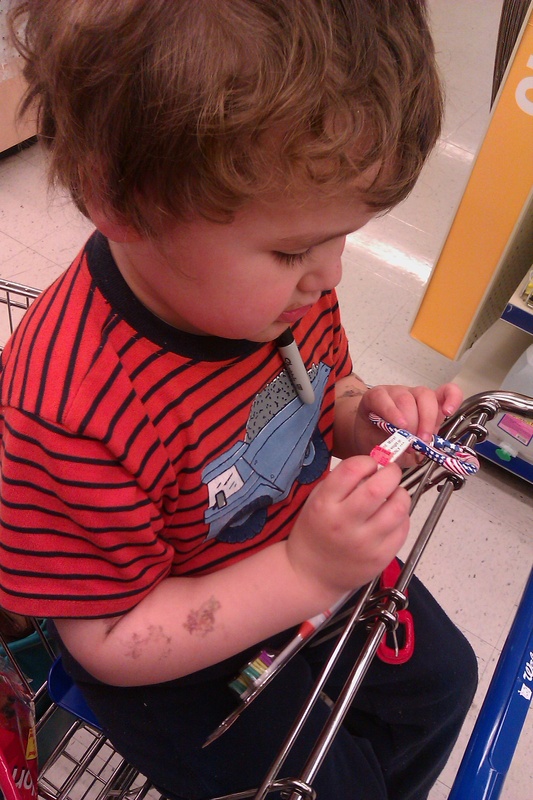 Mikko picked up this suh-weeeet, patriotic carabiner that then prompted us all to head over to Home Depot to buy some fake keys for the boys. Yea for the clearance bins! You'll be happy to know that I really, really thought it would be funny to buy and review laxatives for those pesky postpartum issues, but Amy in her wisdom talked me out of it and I will keep mum on my ordeal… I did, however, determine that the active ingredients were indeed the same as the pricier name-brand options, so I would go with the Walgreens Brand if given the choice. 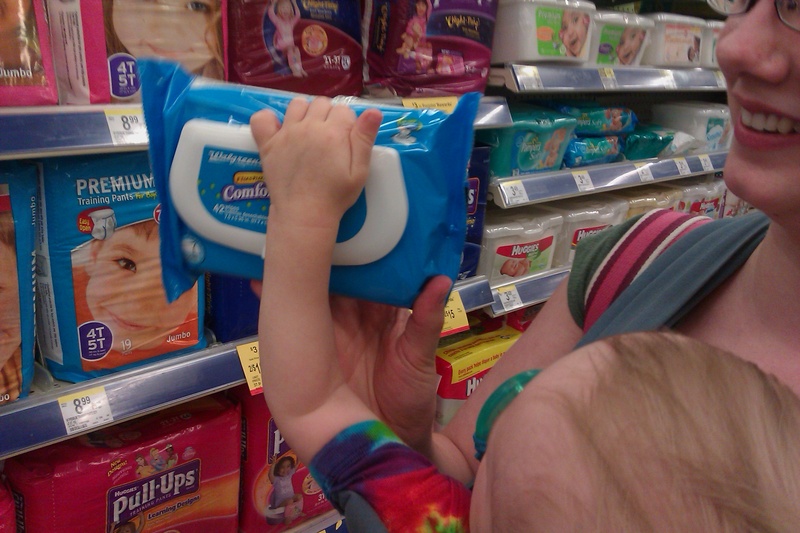 And Amy and her little one picked out some Walgreens Brand flushable wipes that were cheaper than the ones she usually buys at the grocery store. See — you'll find it hard to resist doing a little extra shopping once you go in for your health and wellness items! There really are a lot of great deals there. So there you have it. Try Walgreens Brand Health & Wellness products. Visit the site for more information.